One of Each: Four microphones. Three men (Two Balding). One woman (Not balding). One of Each, formed in July 2002, has been performing in coffee shops and bus shelters, spitting on and occasionally entertaining audiences around the Bay Area. Originally born Oswald Giraffe, One of Each cocooned, pupated, and emerged a terrifying creature of tremendous power and girth...emerged a force for truth and justice...emerged blinking in the harsh stage lights. Dubbed ³pretty good² by a nameless, drunk local critic, One Of Each seems poised to take on the a cappella world. Tune-ami - This group is a newly formed vocal band all the way from Reno, Nevada. They have 5 talented singers from various musical backgrounds. Though their tastes differ, they've immersed themselves in 50's & 60's Doo-Wop with a splash of contemporary style. After drowning in an ocean of unacceptable names. they caught the wave that is......Tune-ami. A tidal wave of vocal harmony! Peter Albin As a principal member of the rock band Big Brother and the Holding Company, Peter achieved rock icon status. Not only the group's bassist, he also played guitar and sang lead vocals on the band's first record (with Janis Joplin), and wrote several of their songs. Subsequent to that auspicious success he played with Country Joe and the Fish, and well as Bay Area supergroup the Dinosaurs. In recent years, while Big Brother continue to tour and perform, Peter began working behind the scenes in the music business. Currently he is Advertising Coordinator for City Hall Records and active in the San Francisco Chapter of NARAS (National Academy of Recording Arts and Sciences). Shaira Cion - Executive Director and singer with the vocal ensemble Kitka are too many to list here. She was the winner of the 1982 National Foundation for the Advancement of the Arts Grant, graduated Phi Beta Kappa from Weslayan with a degree in Ethnomusicology, and earned an Advanced Certificate from the Moscow Conservatory in 1996. Meanwhile, she was Director of Operations for the Women's Philharmonic Orchestra. With Kitka, she performed at the National Festival of Bulgarian Folklore, where they were the first non-native act. Kitka also contributed music to the films "Braveheart," "Jacob's Ladder" and "At Play in the Fields of the Lord," as well as releasing three CD's, the latest of which is entitled The Vine. Juliette Green is a Bay Area jazz vocalist and music educator. She was one of the founding members of the award-winning a cappella jazz group +4db, and has also performed with Bay Area groups Vocal Flight, InFusion, Without Measure, and Saved Soul. (For anyone who doesn't already know, one of the many accomplishments of +4db was to win the Harmony Sweepstakes Bay Area Regionals twice, both in 1998 and 2000.) By day, she teaches music and drama at the Corte Madera School in Portola Valley. Currently, she is singing and writing lyrics with Dave Duran (also from +4db) under the name Vocalese Inc., and she is working on a solo CD that will be released this spring. Dave Worm began his vocal career in 1985 with the Bay Area groups Jazz Mouth and Vocal Front. In 1988 he became a founding member of Bobby Mcferrin's Voicestra ensemble and has remained a regular performer with Mcferrin, touring with the early quartet, Hard Choral and his most recent project Circlesongs. 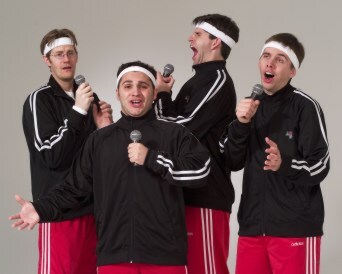 David is also one of three original members of the a cappella group SoVoSo. David has worked extensively with the dance community, having scored or co-written original works for ODC, Robert Moses¹ Kin and Suzanne Gallo. David is an in-house musical producer for Sales America, and has appeared in music videos for Kawasaki and Levi Straus. He also has recorded 2 CD's with his rock band Glass House.